Vista esta formulario en Inglés. The New Jersey chemical exposure accident lawyers at the East Brunswick New Jersey personal injury law firm of Martin Kane Kuper, LLC work hard for victims of serious injury caused by all types of industrial accidents, including those involving chemical exposure. They work for both defendants and plaintiffs statewide in New Jersey and in Middlesex County. Under normal circumstances, construction workers are limited to workers’ compensation for their on-the-job injuries resulting from industrial machinery defects and chemical exposure. However, both New Jersey and Federal laws impose job site safety responsibilities on the general and subcontractors. The negligence of another contractor on the work site or defective machinery and equipment may be grounds for a liability lawsuit. In certain instances, New Jersey law will allow an injured worker to sue his employer, outside of the workman’s compensation courts, in a civil action where it can be demonstrated that known flagrant safety violations created conditions for such a disaster as chemical exposure. The experienced professionals at Martin Kane Kuper work quickly to preserve evidence at the scene and identify the cause of the injury or wrongful death. Employers or general contractors are liable for willful, wanton, or egregious disregard of safety, such as ordering workers into hazardous situations, skimping on safety equipment or knowingly ignoring OSHA regulations. The New Jersey chemical exposure accident lawyers at Martin Kane Kuper LLC are among the few remaining attorneys who still practice in the challenging area of litigation. 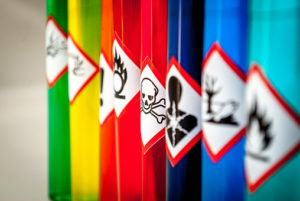 Chemical exposure accidents can affect anyone, and the trial lawyers in our East Brunswick New Jersey personal injury law firm have won large court-awarded settlements and verdicts for customers around New Jersey. Contact our East Brunswick New Jersey personal injury law firm and tell one of our New Jersey chemical exposure accident lawyers about your issue. The team of Martin Kane Kuper LLC lawyers will provide a true assessment of whether we feel you should pursue your case, and then will work with you to win for you what you justly deserve. The East Brunswick, New Jersey, personal injury law firm of Martin Kane Kuper, LLC represents clients in; New Brunswick, North Brunswick, South Brunswick, East Brunswick, Edison, Woodbridge, Piscataway, Elizabeth, Newark, Old Bridge, Princeton, Sayreville, Freehold, Red Bank, Toms River and all communities of Middlesex County, Monmouth County, Union County, Somerset County, Mercer County, Hunterdon County, Ocean County, Essex County, Camden County, Burlington County, Warren County and Sussex County.